Having dealt with some of the myths surrounding this aromatic herb, and considered some of its uses in cooking and herbal remedies, readers will want to know how best to grow this plant of many benefits. Said by some to be one of the easiest plants in the world, parsley thrives in well-drained, moisture-retentive, nutrient-rich soil. However, drainage is important because water logged roots can result in crown rot (rotting where the stem meets the root, usually fatal!). Parsley can be grown in containers, but because this plant can also be a little fussy, it will benefit from compost, rotted organic matter and a little bit of general purpose fertiliser. Parsley can be grown year round in many parts of New Zealand, but in colder areas sow in late summer. It grows best whenreceiving six hours of sunlight a day with shade for the rest of the time. Growing from seed can require at least a 3-4 week germination period, often longer, and because it doesn’t transplant well, some trial and error may be needed. Because parsley doesn’t like being transplanted sometimes the best option might be to sow directly into ground (warm areas and after frosts are over) or grow in pots/planters so no transplanting is required. Soak seeds in warm water for about 24 hours before planting, this will help with germination. Once established, remember to thin seedlings to about 20cm apart, giving them room to grow. Water regularly to prevent drying out but take care not to over water. Feed with liquid fertiliser about every four weeks. Note: if buying plants from a local nursery, choose smaller plants as larger plants may be root bound and when planted could bolt and go to seed quickly. Give parsley time to grow and establish; if picked too young, growth will be stunted. Clip away any yellow, dying or dead leaves on mature plants and side dress with compost, manure or blood and bone in mid season. Parsley can also be prevented from going to seed too quickly by cutting back the flat topped flower heads when they appear i.e. before plant has gone to seed. This will encourage the plants to produce leaves for a longer period of time. If blooms have formed, deadhead before they go to seed. Cut flower stalks at the root and don’t be afraid to prune parsley if plants are growing too high. Occasionally, top plants by about 85mm to maintain a nice appearance whilst also encouraging leaf growth. Be careful when weeding not to disturb the tap root and if growing in a pot make sure the pot is deep enough to give the tap root room to grow. Forget shallow containers. 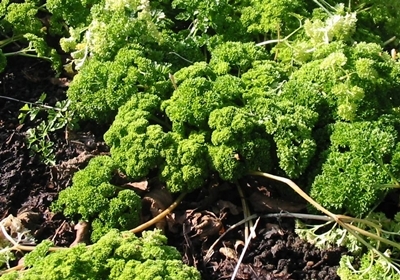 Keep parsley well watered in hot, dry conditions. Pick parsley as you need it by cutting the outermost stalks just above ground level. This will also promote further growth. As you harvest work inwards and don’t worry about taking too much, healthy plants bounce back. Of course, gardeners need to remember that parsley is a biennial and after two years it will bolt (send up lots of flower stalks) then seed and die. When this starts to happen in earnest, dig up and discard the old plant. Nothing will prevent its dying although some will self-seed and grow back the following season just don’t count on it. Uses – cooking and medical; click here for more information.